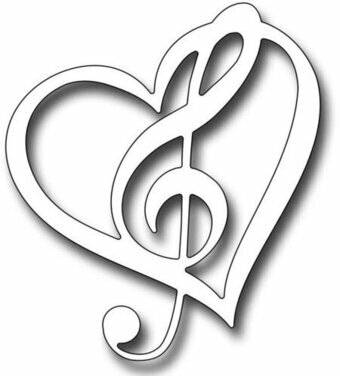 Embossing Folders Vintasia Music size 4 x 6 inches or 106 x 152mm. Features a background of musical instruments. Music themed Craft Die featuring a Treble Clef. Add texture and style to your paper and cardstock projects with Darice's embossing folder! The folder measures 5-3/4x4-1/4 inches and will fit most embossing machines. Each package contains one folder. Available in a variety of designs: each sold separately. Craft die featuring a swirl with musical notes. Pretty and innovative cutting dies to help you create beautiful cards, scrapbook pages and other handcrafted projects! Can be used with most die cutting machines. 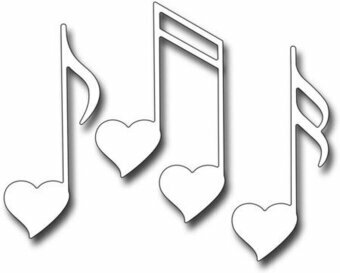 The Love Notes die set contains 3 music notes dies with curved hearts at the note end. The largest (double eigth note) measures 1.25" x 2.25". This set of dies is perfect for both musical and love themed cards. Our Frantic Stamper Precision Dies work in most consumer table top die cutting machines such as the Cuttlebug, Big Shot, vagabond, Boss Cut, and Grand Calibur. Some dies may require the use of a metal shim depending on your machine. Poppystamps craft die featuring a Musical Happy Birthday sentiment. Memory Box/Poppy Stamps craft dies are made of 100% steel. For use on cardstock, felt, and fabric. Cut, stencil, emboss, create! Use in most leading die cut systems. Our Musical Quartet die set features 4 musical instrument dies. The harp die measures 1.625" x 1.875". The flute die measures 2.375" x 0.25". The bass die measures 0.875" x 2.15". The violin die measures 0.7" x 2". Our Frantic Stamper Precision Dies work in most consumer table top die cutting machines such as the Cuttlebug, Big Shot, vagabond, Boss Cut, and Grand Calibur. Some dies may require the use of a metal shim depending on your machine. This package contains one 6"x6" paper pad with 23 sheets of double-sided cardstock in 16 designs. The Coved Musical Labels die cuts all 5 frames in 1 pass. The frames feature delicate musical cutouts. The largest frame measures 3.5" x 4.625". Also included is a small die nested in (which you can separate with metal snips), of a treble clef. The treble clef die measures 0.4" x 1". Our Frantic Stamper Precision Dies work in most consumer table top die cutting machines such as the Cuttlebug, Big Shot, vagabond, Boss Cut, and Grand Calibur. Some dies may require the use of a metal shim depending on your machine. The Dance Rock Sing die set contains 7 dies to mix and match. Form several sentiments such as: You Rock, Let's Dance, Sing & Dance, Rock & Roll and more. The You die measures: 1.25" x 1". The Dance die measures 2.4" x 1.375". The Rock die measures 1.75" x 1". The Sing die measures 1.7" x 1". All the dies in this set feature the elegant scroll font used in the Love and Kisses die set (FRA10351) for even more creative opportunities! Our Frantic Stamper Precision Dies work in most consumer table top die cutting machines such as the Cuttlebug, Big Shot, vagabond, Boss Cut, and Grand Calibur. Some dies may require the use of a metal shim depending on your machine. This pretty die includes a music note nested between two roses. Includes 1 die. Size: 3.75 x 1.5 inches. Craft die featuring a label with musical notes. Pretty and innovative cutting dies to help you create beautiful cards, scrapbook pages and other handcrafted projects! Can be used with most die cutting machines.